Palissandre Cote Ouest Resort and Spa is an ideal place to enjoy water-based activities and visit the Avenue of Baobabs, while taking time out to relax by the sea. The bungalows are built in the traditional style using wood and thatch, yet offer 21st century comforts such as air conditioning, TV, minibar and en-suite shower room with hot and cold running water. Each has a private terrace facing the beach. You can enjoy all manner of water-based activiries including snorkelling, windsurfing and sailing, take boat rides along the coast and into the mangroves, and go fishing. The Avenue of Baobabs is just a 30 minute drive away, an immensly impressive sight that should not be missed. It is also possible to visit Tsingy de Bemaraha on a full day excursion, as well as explore the local area with a guide on nature and cultural tours. The hotel has an outdoor pool, and a spa offering soothing massages to help ease any aches and pains after a day out and about. The shop stocks a range of local handicrafts which make great gifts and souvenirs. The bar is the perfect spot to sip a pre-dinner cocktail as you watch the sunset, before heading to the restaurant for dinner. Open: Palissandre Cote Ouest is open all year. Location: The hotel is on Nosy Kely beach in Morondava, on the west coast of Madagascar. Rooms: There are 30 bungalows built largely of wood and thatch, each providing 32sqm of space. Every bungalow has a private sea-facing deck with a table and chairs. Beds have mosquito nets and bedrooms have satellite TV, minibar, safe and hairdryer, and there is an en-suite shower room. All bungalows are air conditioned. Activities: Water-based activities include snorkelling, diving, windsurfing, sailing, pedalo rides, kayaking, boat rides along the coast and in the mangroves, and fishing. There are opportunities for petanque, tennis and archery. The famous Avenue of Baobabs is just a half hour drive away. 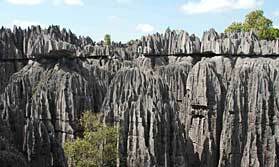 Tsingy de Bemaraha is some 200kms from the hotel and can be visited on a full day excursion. The hotel can arrange a number of local nature and cultural excursions. Facilities: The hotel has a restaurant and bar. Recreational facilities include an outdoor swimming pool and a spa. There is a tennis court, petanque piste and archery equipment. The hotel shop sells locally made handicrafts and essential oils. There is a currency exchange. The hotel provides a laundry service. Dining: The restaurant offers both local and international dishes. Breakfast is a buffet with a choice of sweet and savoury dishes. On some evenings there is live music to accompany dinner. Children: Children of all ages are welcome. Bungalows can accommodate up to 2 adults and 2 children. Babysitting can be arranged on request. A wonderful tour through the dry forest, baobabs and 'tsingy' of western Madagascar with chances to see unique wildlife species. 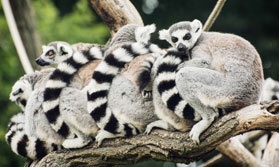 "We stayed twice - on the way to the Tsingy and back. Again well described in the itinerary"
"This was a comfortable stay. The lodge was well laid out and spacious. We were away from the beach so backed on to the road which was noisy at times. The food was good and we felt relaxed here."